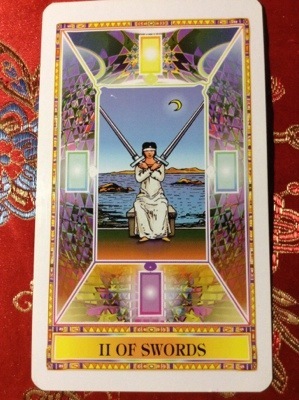 Today, we have the 2 of Swords and the Moon enters Scorpio. It reminds me of the book I am currently reading. Swords are thoughts. People can get distracted by details and lose sight of what is really happening. Like when the magician creates an illusion by drawing attention to the left he is doing something on the right. Magicians aren’t the only ones who do this. People sometimes do this too. They want you to look in another direction while they’re covertly doing something else. They put up a distraction. A person can also distract themselves with too much mental clutter, failing to see what they intuitively know. The advice for today is to listen to your intuition and not get distracted by the ‘show’, even when you’re the one creating the show in your head. How are you feeling under the Scorpio Moon? Are you looking below the surface?